Effective Spot and Stain Remover, formulated to dissolve grease and oil quickly. The thin clear liquid crystalises the remaining grease or oil to enable it to be vacuumed or brushed away. 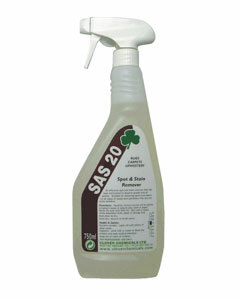 Suitable for removing spots and stains on all types of carpet and upholstery that are not harmed by water. SAS 20 is ideal for use in hotels, offices, shops, stores, airports, public buildings and rooms, leisure centres and nursing homes.